Niani L. Coker | Reaching New Heights Foundation Inc.
Niani Coker is a senior student professional at Cal State University Northridge (CSUN) majoring in kinesiology. She is a health fitness trainer and coach, teaching and inspiring others to experience a physical and nutritional healthy lifestyle. Her very energetic, action oriented, outgoing personality positively impacts the environment. 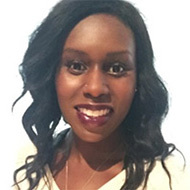 Niani enjoy working with people and is currently pursuing a degree in Occupational Therapist specializing in motor development. Her desire is to work primarily with veterans and children. Niani anticipates starting a Master’s degree program in the fall of 2016 studying Medical Administration. She is a very active young professional on the campus of CSUN. Currently she holds several positions with on campus organizations executive secretary and volunteer with an organization whose primary mission is to serve others. When Niani is not attending classes, working, volunteering, attending meetings she works with her own clients for one on one personal healthy training. Niani aspires to be a lifelong learner seeking new ways to learn and make an impact in the lives of Veterans and others. While academia has its value, Niani believes that education takes place inside and outside the classroom as well. Niani’s volunteer experience as a Peer Health Educator has given her the opportunity to work with many diverse groups of people. She learned the importance of listening to people’s various situations to help them overcome significant socio-economical, geographical and societal barriers that prevent them from making healthy decisions about their nutrition and physical activity. Niani believes that a healthy diet and active lifestyle can truly change the world one person at a time.